Live Healthy: Donuts vs apples: which make you happier? 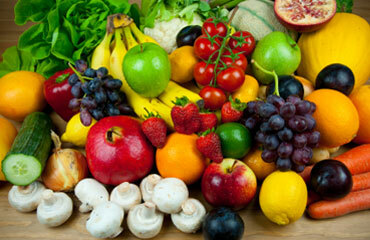 Study shows eating fruits and veggies every day makes you happier.. It's one of my favorite questions. 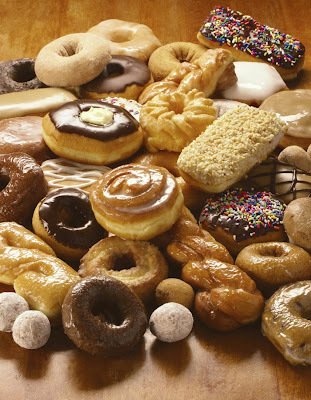 For most people given the choice of a plate of glazed donuts or a plate of veggies; most will reach for the donuts with a smile and anticipated gratification. A plate of fruit tends to fair a little better than its veggie friends against the donuts, but donuts or similar confectionaries typically win. Interestingly many may even treat the plate full of fruits and veggies as a joke, speaking and thinking disparagingly about it while at the same time showing an almost religious preference for the junk food. Research shows us that the flavours and associated reward stimulating effects of high fat, sugar, and salt foods habituates us to such foods. Our brains remember how good the instant gratification was the last time we ate this stuff so the next time the chance comes along the brains reward seeking chemistry kicks in and we feel compeled to eat the fatty, sugary, salty food, and when we do the reward centres in our brains have a bit of a freak out. That's why we say, "OMG, I can't believe how good this tastes", we don't say that when we eat broccoli, even when we really like broccoli. Fruits and veggies don't have the concentration of fat, sugars, and salt to stimulate our brains reward centres to that degree. We get a delivery of feel good dopamine more quickly and more profoundly from junk foods than from healthier choices. Instant gratification; powerful instant gratification. If you've ever wondered why these foods make us feel this way, that's why. Studies also show a negative after affect; when high calorie foods are over consumed feelings of regret or even guilt will develop as the person reflects on what we also know about these foods: they're not the best choice where our health and well being are concerned. A cycle ensues where to help placate negative emotions, or to repeat the reward, seeking out rewarding foods is done. So, during the moment you're eating crap your rational thinking is distracted by the food stimulating your reward centres. Later the negative feelings return because eating didn't do anything to address the underlying causes of feeling bad, and also because once the "high" from eating junk has passed, you realize that you've just done yourself more harm through overeating. To deal with this, many will feel compelled to overeat again, feeling like they're caught in a helpless trap. What if healthy food choices could also feel rewarding; but not have the guilt afterwards? In the Jan 2013 issue of the British Journal of Health Psychology, Authors Bonnie White et al found that on days people reported feeling good they had also consumed greater amounts of fruit and veggies, or had consumed more f's and v's the day prior. 7-8 servings of fruits and veggies daily predicted study subjects reporting greater emotional well being the next day. The study was modeled in such a way that researchers were able to show that it wasn't that feeling good lead to eating more fruits and veggies, but rather that eating more fruits and veggies lead to feeling good. My own experience is that when I eat healthy I feel more deeply gratified because not only does the food taste good, but I know I've done myself good instead of harm. It took me a while to figure out that if I avoided the overdoing it with junk food, I no longer had to contend with the negative emotional after affect, or the weight gain that went with it. It was in realizing that this intense reward association from crap food was really more of a narcotic effect that anything else that allowed me to realize, "Ok, I get why this junk food makes me feel this way, but I don't need to feel this way in order to be satisfied or happy with eating." It was the same as realizing that at the moment smoking a cigarette provided a sense of reward, but that I didn't need the smoking reward in order to feel good, and that the long term negative effects of smoking crushed any fleeting moments of satisfaction it would bring. Overal healthy eating makes us feel better not only because we will factually become physically healthier because of it, but because healthy eating doesn't have emotional baggage that comes with it. Eating fruits and veggies daily and avoiding overeating doesn't appear to have the ability to contribute to feeling bad, it can only make you feel good. Scientific proof that eating apples makes you feel good. Gotta love that! I've always felt better when I'm fit, at a healthy weight, and active. This makes sense because exercise and fitness have been shown to positively affect mood, ability to cope with stress, have fewer colds, provide better sleep, and many other positive benefits. Changing to healthy habits can be daunting for many though because it seems like such a diversion from living with unhealthy choices, and because of habituation, the unhealthy choices, ironically, are perceived as feeling more familiar and more comfortable. Adding to the challenge to change are all the myths out there about how hard exercise has to be (it doesn't), and how "strict" so called "dieting" has to be. None of this is true, but when these myths are believed, most people feel like changing is going to be unrewarding and difficult. The rewards are great though, especially dropping the ball and chain of being tied to relentless overeating and lack of physical activity. Eating fruits and veggies, reducing calories, being active, and maintaining a healthy weight really do make you truly happy. You have nothing to lose, so go for it.